Ultraviolet Grasslands was Luka Rejec's first larger product on his Patreon and has recently launched on kickstarter. The genre is metal-hurlant-slow-crawl-trading-and-exploring and everything that fits in there. From psionic cats to spectrum satraps to null objects of desire, there is a lot of ... stuff in there without suffocating a referee with too much detail, leaving lots of room for your own stuff. For example, the Ultraviolet Grasslands are the far end of the Rainbowlands, and while there are some tidbits about the various Rainbowlands, it's mostly half sentences or seemingly throw-away remarks that to me feel like an invitation to fill up the gaps and make your own Rainbowlands. Or not, if you're not into that. It's just enough to provide a kaleidoscope of backdrop figments as it stands. I've been refereeing with the Patreon version for five sessions now and it already is serviceable as is. Most locations fit on a double spread. The setting specific rules are easy and light enough to be bolted on to any game system you want to use (I would recommend using something light and OD&D inspired like Macchiato Monsters or MageBlade! which is what I am using). Started a wiki for the campaign. Created a Referee Reference and a Character Sheet. Offer the players more ways to interact with the world. Highlight the exploration angle? Make the trading / caravan aspect a more organic part of the game without ripping a traveller-trading-simulations sized hole into it. I've been complicit with some of Zaks actions in the RPG community, by defending/rationalizing him in public and private in the past. I stopped that, unrelatedly, roughly about the time that Mandy Morbid left him, but it was for unrelated reasons, mainly to extricate myself from his system of community manipulation. I can only ask forgiveness of those that I left standing by their own, failing to be an ally, while I knew about these things. 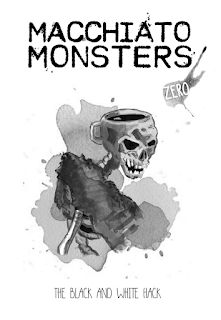 Macchiato Monsters ZERO is a hack of hacks (Black Hack and White Hack, neither of which I know myself). It has some nice mechanics that a both tight and loose, comfortable in a word. The game is complete, has some nice mechanics (I like the death-spirally/doom-clocky risk dice, and the roll all the dice fast equipment generation method). I guess some people will take umbrage with the single-die-roll-combat resolution (players roll and do damage on success/take damage on failure), but I guess that is more about how that feels ... Dungeon World players might feel right at home. The recently added Extra Shots has a number of referee facing tools that uses the resource die mechanic to have semi-dynamic encounter / event tables: The worse the circumstances, the lower the die size, the worse the result. It's nice that in the current work-in-progress the extra shots each fit one page. There are also some in-progress die drop tables which are another bunch of tools for quick off-the-cuff prep in the macchiato-fantasy, which is described as "borderlands style" (i.e. exploration of dangerous mostly unknown area, plus safe havens/points of light to return back to). The map generator deserves extra mention because it is not purely random but somewhat procedural. This promises somewhat more natural looking maps. 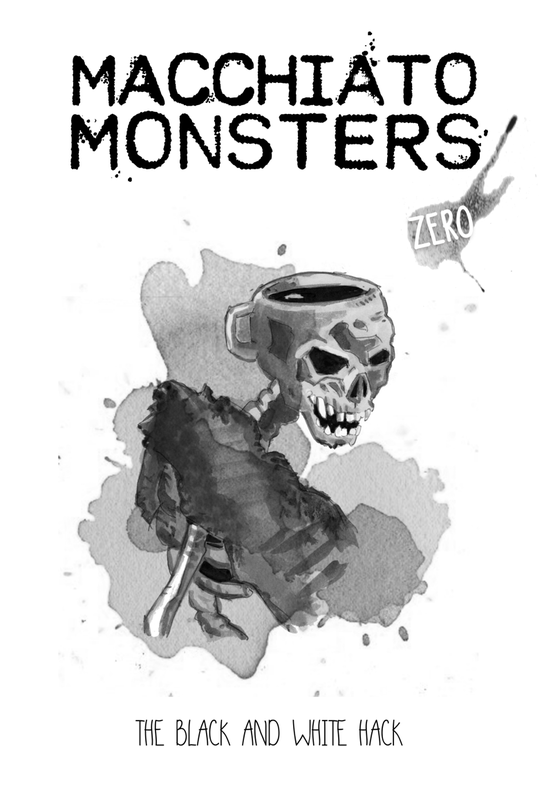 Macchiato Monsters ZERO is available in print from Lost Pages, and in PDF form from OBS.